Google Pixel 2 XL review | What Hi-Fi? The battle between Apple and Google has, for a good while, been a battle of software versus hardware. Google’s Android operating system – found in a multitude of other companies’ smartphones – touted personalisation, access to the depths of the OS,and the promise of cutting-edge software upgrades. Apple, however, boasts the synergy between hardware and software that can only come by having direct control over almost every aspect of the smartphone’s manufacture. Naturally, Google made the move into hardware - even if its first devices were built by other companies. The first Google Pixel phone arrived in 2016, announced with the tagline “Made by Google inside and out”. Now, we have the latest range, the Pixel 2 and the Pixel 2 XL - it's the latter that's on test here. Put the Pixel 2 next to the original Pixel and you’d be hard-pressed to tell them apart. Much like the iPhone 8 Plus and the iPhone 7 Plus, the name of the game is ‘improvement’ rather than ‘overhaul’. There are some slight changes to the body: the 6in screen remains the same, but the actual phone is a few millimeters taller and wider - and slightly thinner, despite keeping the same weight. On the top and bottom are dual front-firing speakers. This is a good use of bezels that otherwise went to waste on the old Pixel, and it comes in handy for casual enjoyment of short videos and social media snippets. The back of the phone now has a matte coating on the bottom 80 per cent of the metal body, which makes it much easier to hold and renders it less susceptible to smudges and prints. It also makes it uglier, which is a shame. Should you drop your phone in the bath, the Pixel 2 XL is IP67 certified for water-resistance, meaning it should survive being dunked in 1m depth for up to 30 minutes. As is becoming de rigueur on high-end phones, the handset is low on buttons and connections. Sleek is the word - it's just a shame about that matte overlay. The lock and volume buttons remain, on the right, and there’s a fingerprint scanner on the back - as is increasingly standard. A USB-C port on the bottom is your only connection, so there’s no 3.5mm headphone jack. A 3.5mm-to-USB adapter is supplied. Our only criticism is the camera lens, which sticks out from the body of the Pixel 2 XL. While the actual extrusion is small, it does mean the phone doesn’t sit flat. We’d rather a slightly deeper phone with a sleeker back. The camera is superb, though – certainly one of the best we’ve seen on a smartphone. There’s a f/1.8 12.2MP lens on the back and a 8MP selfie camera - this might seem par-for-the-course, but the processing built-into the Pixel 2 XL means that it packs in the detail and levels out the differences in exposure, thanks to its Auto HDR+ setting. Moreover, the Pixel Visual Core chip, which helps make the camera so impressive, is enabled for third-party apps now too. Instagram, Snapchat and Whatsapp can now all use this to enhance snaps taken within the apps. And according to Google, you’ll use less of your battery while taking photos. Thankfully, despite all the tech, you don’t need to get your hands dirty in the settings to get brilliant photos – the Pixel 2 XL delivers natural, insightful pictures with authentic colours and crisp edges. Both bright and dark conditions are handled with aplomb. Powering the Pixel 2 XL is Android 8.0 Oreo, the most recent version of the operating system, and with it comes a menagerie of little tweaks that make this smartphone more useful than the original Pixel. There's picture-in-picture for watching videos, adaptive icons to better customise the home screen, snoozing notifications and notification dots. Unique to Google’s brand of smartphones, there’s no pre-installed bloatware from the hardware manufacturer as there is with many other Android phones. The Pixel 2, like the original Pixel, is pure Google. Using the phone is a much more streamlined operation as a result. That’s not to say it’s entirely customisable, however. The home screen gives over real estate to a fixed Google search bar (at the bottom) and a time and date widget (at the top). Neither can be removed. Similarly, the back and open apps buttons can’t be flipped, unlike on other Android phones. Inside, a Qualcomm Snapdragon 835 processor keeps the phone speedy and responsive. And it’s certainly rapid in use compared to most flagship phones, with only the Samsung Galaxy S9+ giving it a run for its money. 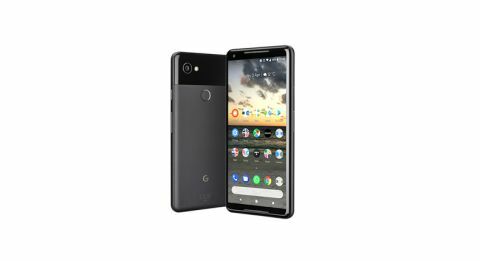 The Pixel 2 XL also has 4GB of RAM and 64GB of storage (or 128GB, if you pay around £100 more). There’s no expandable memory, though, so no facility for a microSD card. The battery clocks in at 3520mAh, which Google claims will deliver seven hours of power from just 15 minutes of charging. We find the Pixel 2 XL has plenty of juice to get you through the day, even if you’re a heavy user. Want more features? Try giving it a quick squeeze. The Pixel 2 and Pixel 2 XL (and the recent HTC U11) have a novel feature: you can squeeze the lower half of the phone to fire up Google Assistant. Assuming the phone is unlocked, it’s more a natural gesture than it sounds, and a quick way to get Google answers, weather and calendar updates (though we find the latter unreliable). If you still use your phone to actually make calls, you can also enjoy the fact the Pixel 2 XL automatically screens spam calls. The screen turns red and carries the message ‘suspected spam caller’, which is a neat way to avoid the cold-callers. Google is planning to roll out more aggressive blocking of nuisance calls, sending them straight to voicemail without so much as a notification. The Pixel phones are likely to get this first, meaning Google’s flagship certainly does have some flagship features. In between those barely-there bezels is the all-important screen. Not just any screen, a pOLED screen (or plastic OLED), with a plastic substrate inside the screen rather than the typical glass. This is a key differentiator from the smaller Pixel phone, which uses a Samsung-suppled OLED rather than this LG-supplied pOLED. It’s a 6in display with a 18:9 aspect ratio and 2880×1440 resolution for 538ppi and, as you might expect, there are some things this screen does really well - including deep blacks and natural skin tones. Watching a download of Come Home on BBC iPlayer, faces look more human on this phone than almost any we’ve seen - and the realism and subtlety afforded by the OLED screen makes it easy to watch. Switch to a Samsung Galaxy S9 or an iPhone 8 Plus, though, and you get a punchier, more colourful delivery, with both digging out more detail in dark and bright corners of the screen. There are adjustments you can make on the Pixel, with the option of Natural, Boosted or Saturated colours, but while this will add some occasionally welcome ruddiness to cheeks, the picture remains on the subdued side. The smooth subtleness of OLED still holds appeal, though, and it’s enjoyable in its own right. The Google Pixel 2 XL has done away with the 3.5mm headphone jack and opted for USB-C for audio and power, as is becoming the increasingly common choice on Android. An adapter is supplied, which works fine (though, for the record, some third party connectors do not), but not any earphones. The phone supports Wireless HD audio with LDAC and aptX HD, should you prefer to ditch the wires. The Pixel 2 XL can play hi-res audio but, even with the best source material, music doesn’t quite come to life. The original Pixel proved underwhelming on the audio side, and this model follows in the same footsteps. Listening to a 24bit FLAC file of Four Tet’s Two Thousand and Seventeen, it lacks the extra layer of subtlety necessary to really draw you into the music. More detail is revealed by the Samsung Galaxy S9, for a more enjoyable experience. In isolation we’re well past the stage of being aggrieved by harsh treble or boomy bass, but instead we find ourselves flicking idly through tracks after barely a minute - which tends to signal a sound that lacks life. Are we not entertained? Not really. This is a flagship Android experience, and we have no qualms with the phone in use or indeed how long you can use it for – as we’d expect for £800. Should you want to take lots of photos, you’re in for a treat, too. If you don’t require much else, and enjoy a big screen, then look no further. Of course, we rather value video and audio quality, and while the Pixel 2 XL is good enough for video, the audio is merely so-so. And that’s something you don’t have to sacrifice on rivals. As is usually the case with smartphones, there are pros and cons here. Ultimately it will depend on your particular spec preferences - all told, the Pixel 2 XL is good, but not quite the great marriage of hardware and software we were hoping for.